Although store bought salad dressings are convenient, it is also really easy to make them at home and I do it all the time. Scattered throughout my salad posts you will find quite the array of salad dressings but they are not all that easy to find hidden away in a recipe for a salad. I thought that I would try focusing on a few salad dressings both to give them the attention that they deserve and to make them easier to find. Out of all the salad dressings out there the ones that I find myself coming back to all the time are vinaigrettes which are really easy to make and taste great. A vinaigrette at its simplest is just oil and vinegar but more often than not vinaigrettes are also seasoned with things like garlic, herbs, cheeses, etc. The basic ratio for oil to vinegar is generally 3 parts oil for 1 part vinegar but I prefer my dressings to be nice and tangy so I normally go with a 1 to 1 ratio but feel free to change this to fit your tastes. One of my favorite vinaigrettes is a balsamic vinaigrette that is pretty simple and really highlights the flavour of the balsamic vinegar. Though I tend to play around with the recipes for salad dressings depending on what mood I am in, the following is the basic recipe. In addition to the balsamic vinegar and the extra virgin olive oil this recipe contains some garlic for flavour, some mustard to help bind the oil and vinegar together and a bit of honey to balance things out. Though many times I make just enough dressing for the salad at hand, it is often convenient to make a bigger batch to have some for quick use later on. When making the larger batches of dressing I like to use glass jars with tight resealable lids so that you can really give them a good shake before using them. Making your own dressing is definitely the way to go. Once I started making my own, I couldn't go back to store bought. This is pretty much my go to recipe, except I use a tablespoon of sugar instead of honey (and if I'm really in a hurry I'll skip the garlic). I think I'll try it with honey next time! Thanks! I'm with you, one hundred percent on this! I even use the canning jars to store it in, so I can give them a good shake! I agree and this recipe has all the right ingredients; will be making it today for sure. Homemade salad dressings are always so much better than storebought ones, which tend to have a weird aftertaste and lots of strange ingredients. Balsamic vinaigrette is a classic. Can't go wrong there! My friend is currently crazy about her balsamic vinegar. Wait till I show her this recipe…. I am a bit snobish about my balsamic vinaigrette! But this Kevin is right up my tastebuds alley! I love making my own salad dressings! Often times, they are healthier than what you can buy at the grocery store. Poppy seeds might be a nice addition to this dressing too! Maybe it's the honey I'm missing — my dressings always turn out too bitter. A lot of the time I'll just set out oil and vinegar and let everyone fend for themselves 🙂 But since that's not very hospitable, I might have to try making this dressing — I even have the jars! Sounds good and easy. A friend just sent me some balsamic vinegar from a farmer's market in Marin County – the best I have ever tasted. I had not realized how different balsamics could be. My "go to" vinaigrette is lemon and good olive oil (which I buy at Williams Sonoma) with some seasonings. I am "brewing" some pomegranate vinegar on my windowsill and am looking forward to using this is a vinaigrette soon. I have recently started making my own dressings and they taste so much better!! I have awarded you with 2 awards. Please check it out on my blog: Cream Cheese Filled Buns. That balsamic recipe looks to die for. I once had a really amazing vinagrette in NYC at a restaurant that is no longer there. I will definitely have to try that. Check out this great recipe I found for amazing Starbucks scones. And here's one for delicious baked beans. You have to try these recipes! I love this dressing, I've been making a similar version for years (substituting brown sugar for the honey). It's fantastic on a steak sandwich with sliced flank steak, white onions, tomatoes, and arugula on a toasted french roll (inspired by a similar Real Simple recipe years ago). Great blog with great recipes! My all time favourite dressing – you've got to use good balsamic vinegar don't you think – makes all the differece! I believe in making one's own salad dressings and this is one I would like to add to my collection of recipes. You make such great recipe's. wanted some help with dijon mustard. Do you have something to make this from scratch ? the mustard and vinegar combo that i tried at home came out too bitter to eat. I love making my own. I use real maple syrup instead of honey. Thanks for the recipe Kevin. Balsamic vinaigrette is one of the few salad dressings that I could guzzle by the gallon. Er, sort of. But I will definitely save this recipe; I like to use vinaigrette on everything! Always make my own. Sort of follow the 3:1 rule, always add mustard and then season the salad.Equally good summer or winter! This blog is outstanding. 🙂 Fantastic pictures and great recipes! This must taste amazing, I love balsamic vinegar! This vinaigrette is lovely! It is not too harsh, my husband might actually like this one. I used it for my grilled veggie salad and it was wonderful. You can read about it here. Thanks so much! Finding a good vinaigrette is actually really hard for me and I will be making this again and again. Absolutely amazing and so simple! I have been singing your praises for quite some time as every recipe I try of yours comes out beautifully, and this recipe was no different! Thank you for filling my kitchen with great, exciting food! This one is the balsamic vinaigrette for me. I've tried several lately, and they were all missing that certain something that this recipe has. I've been taking salads to work lately, and last week it was spinach, feta, dried cranberries, sliced pears and walnuts topped with your recipe – delish! I've been making this recipe for a few weeks now. I've only made one minor change. I didn't have any honey on hand so substituted agave nectar. 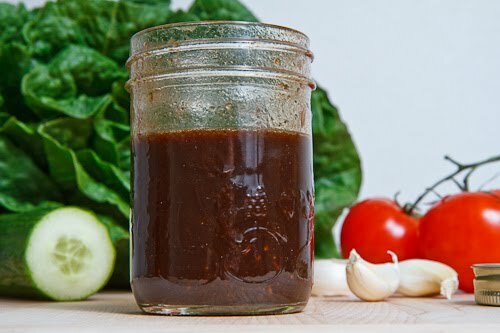 I will never buy store-bought balsamic vinaigrette again! Delicious on so many things…dunked garlic cheese breadsticks in it the other night. So, so good. Linda: A blueberry vinaigrette blueberries and blueberry infused vinegar would be amazing! Yes, you can use my raspberry vinaigrette recipe as a base!